Blueberries, raspberries, strawberries? Your choice. This berry awesome frozen cheesecake tastes fantastic no matter what kind of berry you use. Mix graham crumbs, 3 Tbsp. sugar and butter until blended; press onto bottom of 9-inch springform pan. Bake 10 min. Beat cream cheese and remaining sugar in large bowl with mixer until blended. Add orange juice; mix well. Gently stir in COOL WHIP and berries; spoon over crust. Freeze 6 hours or until firm. Let stand at room temperature 15 min. before serving. Substitute your favorite citrus drink, such as raspberry juice, limeade, grape juice or pink lemonade, for the orange juice. 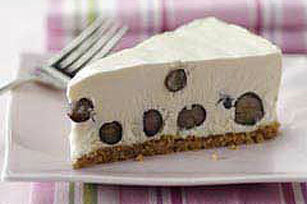 This refreshing cheesecake can be frozen up to 3 weeks before serving. Just wrap securely in plastic wrap, then foil before freezing.